In Baltimore, Maryland, the Craig Willinger Fund brings hope and healing to young soccer fans battling cancer by creating once-in-a-lifetime opportunities to see their favorite teams. 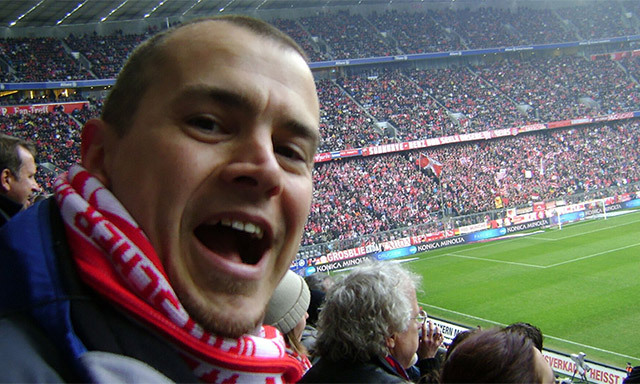 The Craig Willinger Fund brings hope and healing to young soccer fans battling cancer by creating once-in-a-lifetime opportunities to see their favorite teams. Born and raised in Baltimore, Maryland, Craig Willinger was a passionate soccer fan who would seize any opportunity to play the game he loved. In fact, the only thing that could stifle his passion was a terminal cancer diagnosis in his late-30’s. Stage 4 chronic lymphocytic leukemia (CLL). When the father of four young girls lost his drive to overcome his diagnosis, Craig’s wife, Johanna, turned to his favorite sport for help. After a chance encounter with a local supporter of Craig’s favorite team, Liverpool FC, Johanna teamed up with the LFC Baltimore Reds to send Craig to a Liverpool match in Germany. The trip was life-changing for Craig. On the flight home, he told Johanna the experience was better than any cancer treatment he had received. In that moment, he realized his purpose was to provide hope and inspiration to young soccer fans facing the same opponent. We need to do this for other people like me. In less than a decade, the Craig Willinger Fund has provided dream trips for 13 young soccer fans stricken with cancer. Just as Craig’s trip did for him, the soccer experiences created by the fund bring joy, emotional healing, and the motivation to keep fighting. Craig Willinger lost his battle in 2012, but the legacy he leaves behind is one of hope, passion, and a love for soccer.